An Alpha is a grayscale intensity map. It can be used to represent intensity, masking, and similar things. 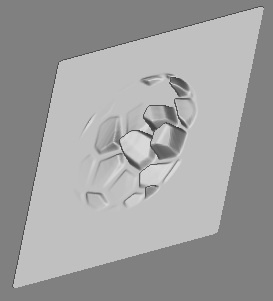 For example, bump maps and displacement maps (both in ZBrush and in other programs) are both alphas; the gray intensity represents the height or depth of the bump or displacement. Note: ZBrush alphas are 16 bits in depth, which simply put means that they can produce much smoother gradations in gray, and hence wherever they used. Some other programs are limited to 8-bit alphas, which can produce noticeable ‘stairstepping’ artifacts. In ZBrush, alphas are used for much more than just bump or displacement maps. They can affect masking (which parts of an model or painting you work with), brush appearance, how colors, or materials are laid down, and the shape of sculpts. And probably a few other things I can’t think of right now. In addition, you can make your own alphas, and also turn alphas into other tools, such as Stencils (which are masking tools that offer a different, and powerful, set of capabilities). Below, we describe the most common ways of obtaining and using alphas. We also give links to pages which describe material significantly related to alphas. Note: The Alpha Palette details all of the controls found in that palette, but you will also find alpha-related controls in other palettes. Many of the standard drawing tools use alphas to control their shape. This affects the depth of pixols on the canvas. Alphas may be used with 3D sculpting brushes to affect the geometry of 3D models. Alphas are the means by which displacement and bump maps are exported from ZBrush. ZBrush comes with a large selection of useful alphas, which can be selected from the Alpha Palette or from the pop-up palette that appears after clicking the large Current Alpha thumbnail. You can of course load your own images for use as alphas using the Load Alpha button in the Alpha palette. Colored images will be converted to grayscale. Note: Some image file formats do not support 16-bit grayscales. If you load such files, you may get the stairstepping effect described earlier. When using external programs to create alphas, try to use one that offers 16-bit grayscales. You may find it more convenient to simply paint a pattern on the screen, and then use the GrabDoc control to convert it into an alpha. The depth of the scene you created will be converted to the alpha (color will be ignored). Since ZBrush supports 16-bit depths, you will get a true 16-bit alpha. Note: Alphas are displayed as thumbnail images in the alpha pop-up palette, but are always saved with the full dimensions of the source image from which they were created. To get a small alpha, you can paint it on a large canvas of the proper aspect ratio, and then reduce the canvas size before making the alpha. Alternatively, a large alpha can be useful when you want to repeatedly apply a lot of detail repeatedly over large areas.